Family and Child Development contributes to the development of young children by enhancing the quality, sufficiency, and affordability of regulated child care services. Family and Child Development also supports family resource centres located in communities throughout Newfoundland and Labrador which provide a variety of community-based activities and resources for children and families. The Provincial Government provides annual funding to the KFFRC for the operating costs associated with running our centres and programs. Government has provided funding since 1999. The Community Foundation of Newfoundland and Labrador (CFNL) is a vehicle that helps individuals, businesses, and charities to establish endowment funds that become permanent community resources. The income from these funds is used to provide annual grants to support community programs across the province in fields like education, arts and culture, health and wellness, environment, and community capacity. The generosity of the Community Foundation of Newfoundland and Labrador allows us to run our “Healthy Families” program, which helps parents/caregivers to learn about food safety, nutritional information, budgeting and Canada’s Food Guide. Healthy Together is an innovative and unique family education program that brings families together to learn to make healthy choices and build healthy relationships. Funding for the Healthy Together program was made possible by The Bridge Youth & Family Services Society, a non-profit, charitable organization, has been developing and providing innovative and quality programming for children, youth and families in the Central Okanagan of British Columbia since 1969. The Bridge has provided funds allowing us to purchase material for the Healthy Together program as well as have staff trained to run the program efficiently and effectively. This program is now incorporated in our regularly scheduled family resource programs. United Way of Newfoundland and Labrador is a charity's charity. As the largest funder of the social sector, second only to the government, United Way distributes funds to charities province-wide who are seeking financial support for various projects they are unable to fund independently. In 2017, United Way provided funding that allowed us to establish an Active Play program in Ferryland. The funding enabled us to purchase equipment we needed for the development and enhancement of children’s motor skills. In 2018, United Way NL again provided funding for a second Active Play program in the community of Kilbride. The funding allowed us to purchase necessary equipment for the development and enhancement of children’s motor skills. 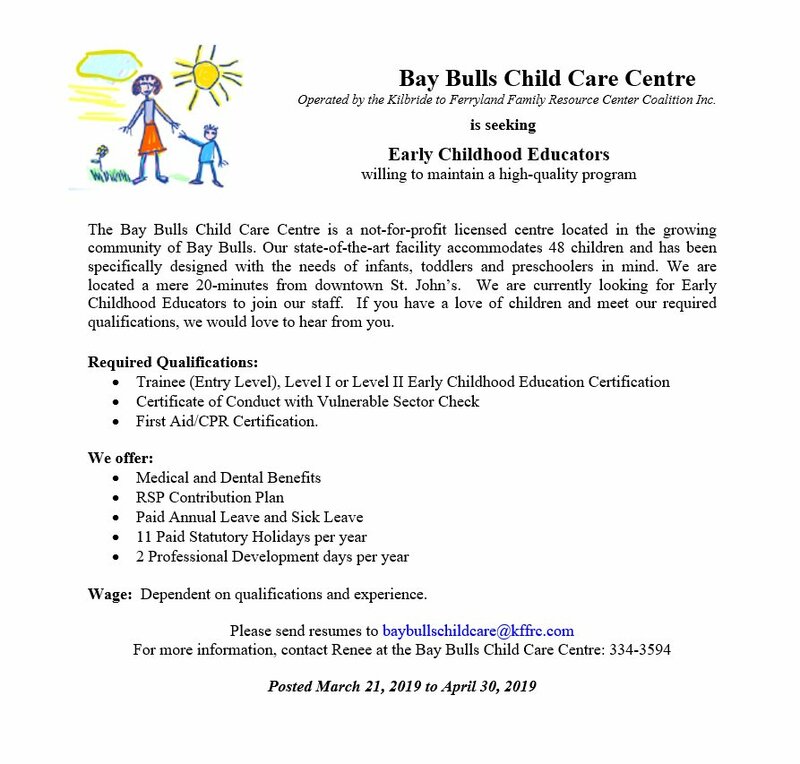 The Wellness Coalition - Avalon East is one of six wellness coalitions in the province of Newfoundland and Labrador and is supported by the Department of Children, Seniors, and Social Development, and by Eastern Health. The Coalitions provide leadership, coordination, and support for local wellness initiatives. They build partnerships by bringing together individuals, groups and organizations interested in working together on common wellness issues in their local regions. Activities may include advocating for healthy public policy, providing community grants to enhance local wellness projects, or developing and delivering community wellness programs. In 2018, we received a grant from the Wellness Coalition – Avalon East which allowed us to update our aging “Book Buddy” program with more recent titles for the children and families to enjoy. In addition, we received grant approval in 2019 for a Snacks for You and Me program which will be operated from Ferryland site. This new program is aimed at young school-aged children to teach them the importance of nutrition, cleanliness and healthy snacks.